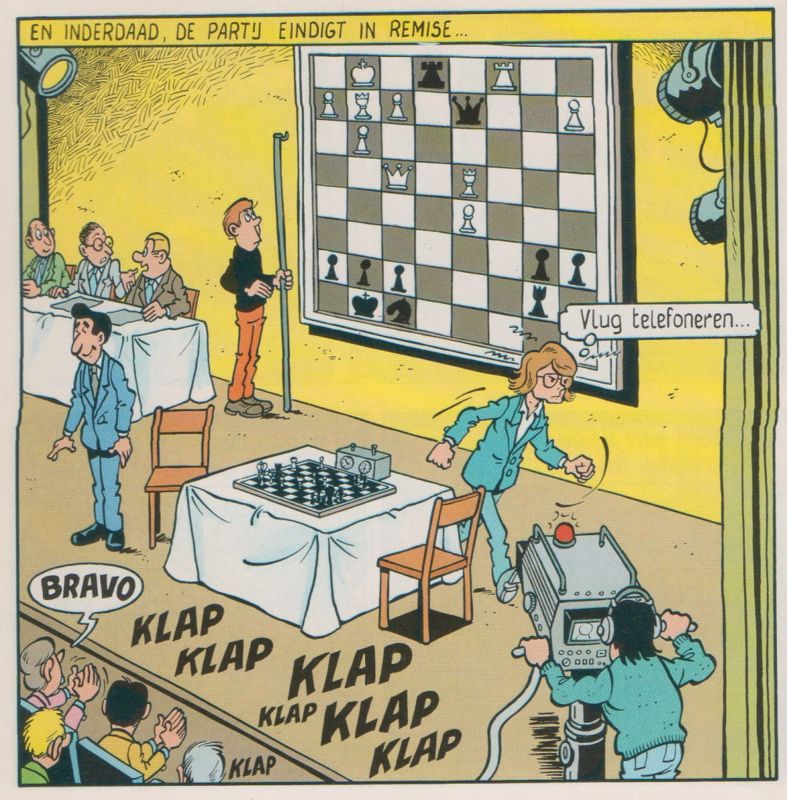 Kiekeboe is a family adventure comic series which is hugely popular in Flanders and, to some extend, the Netherlands. The series has been running for more than four decades and well over a hundred volumes. Especially in the beginning of the series, the stories were often inspired by whatever happened to be in the news. In those days, that meant things like Idi Amin Dada, the Bermuda triangle, or the Karpov vs. Korchnoi world championship matches. The plot of the fourteenth volume is about a grandmaster trying to lay his hands on the chips of a supposedly unbeatable computer. Unsurprisingly, things do not go as smoothly as he hopes, and while his goons are desperately trying to get the blasted things, he’s playing the first games of his match. The X-men, as most of you doubtlessly know, are an American team of superheroes. They get their name from their mentor, professor Xavier, and the fact that the X is the most x-treme letter of the alphabet. The team is composed of a number of powerful mutants like Wolverine, a super-regenerating strongman with retractable bone claws, Storm, who can fly and control the weather, and Cyclops, who can shoot energy beams out of his eyes. There are any number of comic books, cartoons, and computer games about the X-men, but we will talk about the 2000 movie, for there is something about it that strikes me as somewhat implausible. Allow me to demonstrate. After dealing with comic books, television series, a computer game, and a commercial I feel it’s high time I tackled a movie. And what better movie to start with than John Carpenter’s The Thing from 1982? It’s about a bunch of scientists stuck on Antarctica that find something nasty in the ice.1 Something which absorbs living creatures and camouflages itself as them. The film is at the time of writing in the imdb top 250 and I can confirm that it is indeed very good. At the beginning of the movie, before things go pear-shaped, we can spot a smirking Kurt Russell2 playing a helicopter pilot by the name of MacReady and a leisurely game of chess against a computer. Let’s dive right in, because there’s a lot to talk about. Chess is just the most exciting thing ever. 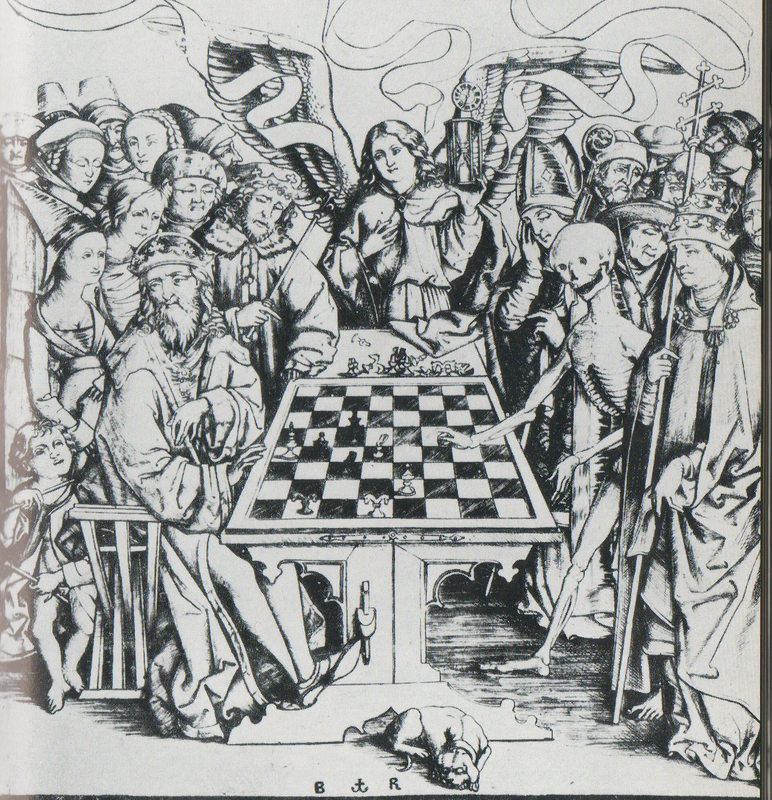 Just think about it: two men staring at some pieces of wood for five hours on end, barely moving, not speaking a word, trying to fork bishops and queens – enough to keep millions watching!1 Still, for some unfathomable reason, people seem to think that chess is boring. It is on this baffling misconception that GEICO plays in this commercial. 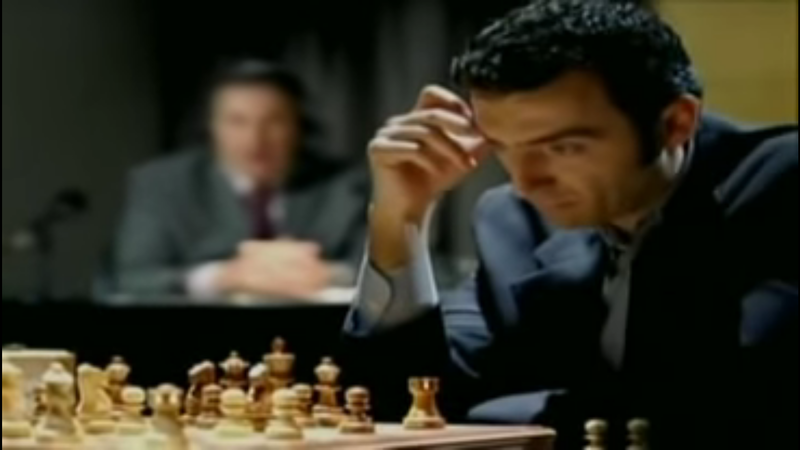 It’s from a series of commercials with supposedly rhetorical questions, one of which is “Can fútbol announcer Andrés Cantor make any sport exciting?” To demonstrate that this is indeed the case, they cut to a chess match he is commenting on. This time, our topic is only tangentially related to chess in popular culture: we will be talking about famous chess enthusiasts. A few lists like this already exist, but they are all rather unsatisfactory. It seems like every celebrity who was ever seen looking at a chess board is included in these lists. I am not interested in people that know the rules and basta. I am also not interested in people that are mainly known as chess players. Magnus Carlsen, for example, did some modelling work but is clearly better known as a chess player. Lasker, too, is mainly known as a chess player.1 Taimanov is a bit of a special case, where it is unclear whether he’s a chess-playing pianist or a piano-playing chess player. There should be published results for a tournament the candidate played in. Rapid and blitz tournament are not admissible. Obviously, simultaneous exhibitions are right out. The candidate must have a wikipedia page, not necessarily in English, mainly concerned with a topic unrelated to chess. The candidate must not offend the whimsy of yours truly, who retains the right to exclude anyone for any reason. Previously, I called The mentalist a mediocre mystery fiction show. By these standards, Numb3rs is dreadful. First of all, the show has given in to 1337 speak. This is bad. Secondly, there is no Simon Baker. This is unforgivable. The show is about a brilliant young mathematician who helps his detective brother solving cases with maths.1 In fact, Numb3rs might also be a contender for a hypothetical Maths in popular culture blog, but there will be enough to talk about if we restrict ourselves to chess. 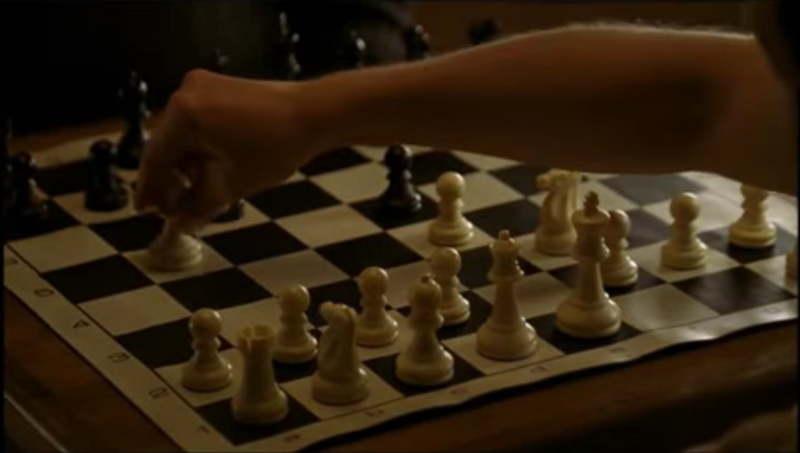 First we will dissect a chess scene from episode nine of the first season. 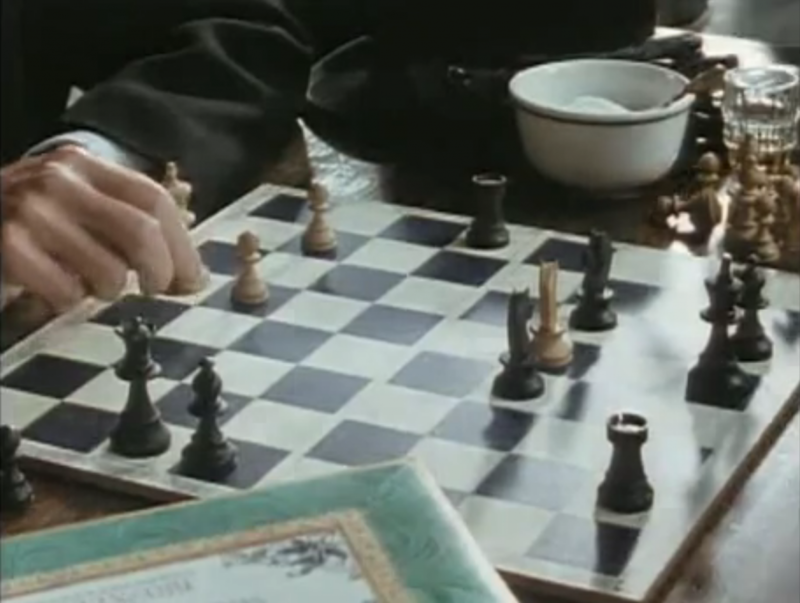 We see the protagonist’s father, Alan, playing chess with a friend, who also helps the FBI. Today we’re going to do something a bit more obscure. So obscure, in fact, that the moniker ‘popular culture’ can barely be justified. Yes, today we leave the burning bright spotlights of hit TV-series and the booming, amped-up volume of big rock concerts to dive into the foreboding depths of long forgotten comic books series. Today, we bid farewell to glamour and fortune. Today, we deal with Klont. Yes, Klont. 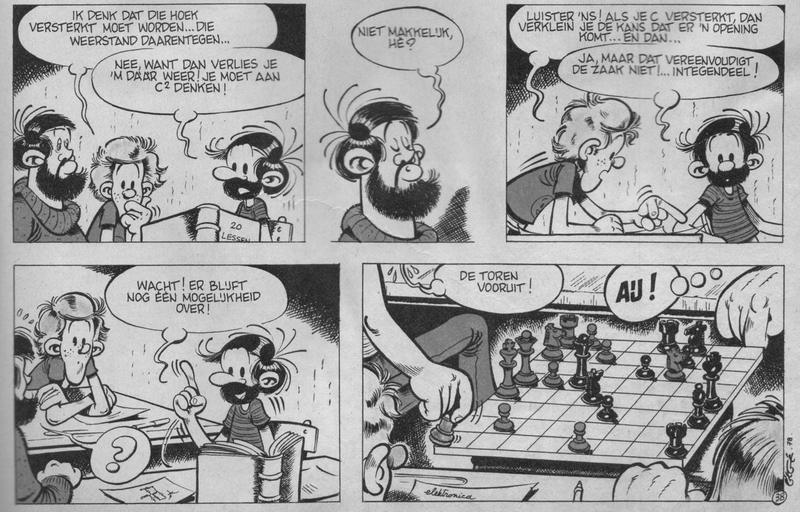 It is a comic series which ran for a short while in Flemish comic magazine Robbedoes, didn’t get picked up, and disappeared like a raindrop in the ocean of Belgium’s gigantic comic scene.1 The comic is centred on the adventures of a bearded college-age guy. In our episode of today, which comes from Robbedoes‘ 33th issue of 1980, we find him in a lesson about electronics.